Now You're Talking!Do you want to be bulletproof at work, secure in your relationship, and content in your own skin? If so, it's more important than ever to be aware of what your body is saying to the outside world. Unfortunately, most of what you've heard from other body language experts is wrong, and, as a result, your actions may be hurting, not helping, you. With sass and a keen eye, media favorite Janine Driver teaches you the skills she used every day to stay alive during her fifteen years as a body-language expert at the ATF. Janine's 7-day plan and her 7-second solutions teach you dozens of body language fixes to turn any interpersonal situation to your advantage. She reveals methods here that other experts refuse to share with the public, and she debunks major myths other experts swear are fact: Giving more eye contact is key when you're trying to impress someone. Not necessarily true. It's actually more important where you point your "belly button." This small body shift communicates true interest more powerfully than constant eye contact. The "steeple" hand gesture will give you the upper hand during negotiations and business meetings. Wrong. Driver has seen this overbearing gesture backfire more often than not. Instead, she suggests two" new" steeples that give you power without making you seem overly aggressive: the Basketball Steeple and the A-OK Two-Fingered Steeple. Happy people command power and attention by smiling just before they meet new people. Studies have shown that people who do this are viewed as Beta Leaders. Alpha leaders smile once they shake your hand and hear your name. At a time when every advantage counts--and first impressions matter more than ever--this is the book to help you really get your message across. 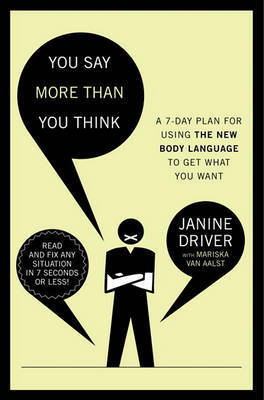 JANINE DRIVER is the founder and president of the Body Language Institute, located in Washington, DC. She is also a body language and deception detection expert and certified business coach who has appeared on NBC's "Today," ABC's "Good Morning America," "The Rachael Ray Show," and "Larry King Live." Janine travels the globe speaking to the corporate world on the fastest way to save time and grow business. Visit her online at lyintamer.com.